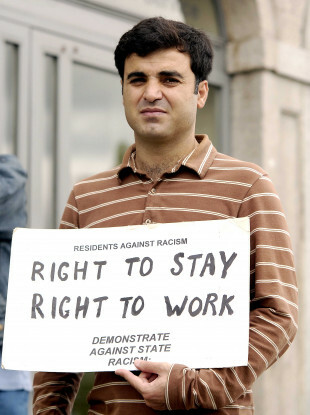 Asylum seeker, Shaho Zamani from Iran, at a protest in Dublin. ASYLUM SEEKERS WILL be able to work under new regulations which will kick in by the end of this week. Announcing the details today, Justice Minister Charlie Flanagan said asylum seekers will be allowed to take up any form of employment except positions in An Garda Síochana, the Defence Forces and the civil service. In addition, applicants to the scheme who gain successful employment will now have the option to leave Direct Provision centres, and seek alternative accommodation, if they so wish. It’s believed 3,000 people will be eligible to take up temporary or permanent jobs. The new rules come a year after the Supreme Court found that the ban on those in direct provision seeking work was unconstitutional. Currently, any refugee who wants to work in Ireland must apply to the Minister of Business, Enterprise and Innovation for an employment permit – this scheme will now be scrapped. Other current obstacles to employment for asylum seekers at the moment is that they can only take up a job that pays €30,000 or more per year. This provision is also being removed. Under the new rules, an asylum must have been in Ireland for a period of nine months and be awaiting a first decision from the International Protection Office about their asylum. If they have been awaiting a decision for that period, they are then eligible to apply for a letter of permission to work in Ireland by the Labour Market Access unit in the Department of Justice. There is no fee or charge for applying. The letter of permission will allow the person be employed or self-employed and will be valid for six months. A person can apply for the permission to be renewed every six months until a final decision on their asylum status is given. An applicant who gets a negative final decision on their refugee status, but who is in the process of appealing the decision can also apply for their permission to work to be renewed. However, once a final decision – after the appeals process is concluded – is made, their labour market access permission will cease. Will those working still get their social welfare payment? Access to social welfare payments will also be permitted to those who find employment. Currently, asylum seekers living in Direct Provision have a weekly allowance of €21.60 and can buy food using a recently introduced points system. This payment will continue to be paid for 12 weeks when a person finds employment, however, depending on their earnings and hours worked, that money may be reduced. Under the new rules, those that do find employment will have to start contributing to the cost of their stay at a Direct Provision centre. The cost per person, per day, for staying in one of these centres is €35. Will working asylum seekers have to pay for their stay at a Direct Provision centre? Once a person is working, a proportion of the cost will be placed on the worker. The more you earn the more you pay. There is no charge for children staying in Direct Provision. This will remain the case, regardless if parents are working. While no one has to leave a Direct Provision Centre, it is envisaged that as more people take up employment, they will seek alternative accommodation. With a shortfall in employment in some sectors, the government said the additional workforce has been welcomed by business groups, with whom department officials are meeting tomorrow. The minister said the scheme will add to the diversity in some workplaces, though there is no incentives for employers to hire those eligible for the programme. The new rules do not allow for asylum seekers to apply for a driving licence, however. “Any changes to the current eligibility requirements is a matter for the Minister for Transport,” said the Department of Justice. Email “Asylum seekers will be allowed to work in Ireland under new rules ”. Feedback on “Asylum seekers will be allowed to work in Ireland under new rules ”.